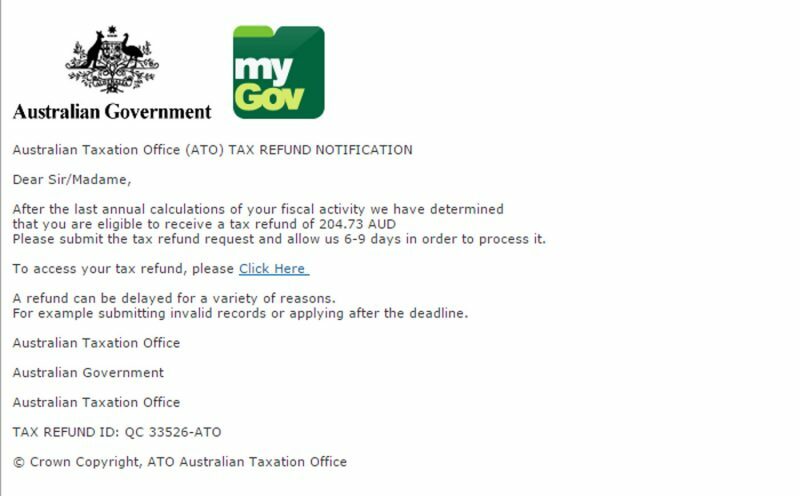 Yet another tax refund phishing scam has started up, this one involving the Australian Taxation Office (ATO). This campaign is similar to earlier phishing campaigns involving fake emails that promise a tax refund. One particular campaign in early 2014 ended up being well publicised, with the ATO and News Ltd posting articles on their websites warning of the scam. It seems that the criminals decided enough time has elapsed since the last campaign. Figure A shows the email in question. The subject line used is “Tax Refund Notification”, whilst the sender is “myGov”. Authentic looking logos for the Australian Government and myGov are used in the email. The email states that the recipient is eligible for a refund; the actual amount listed is immaterial; it may vary from email to email. A link is provided to enable the recipient to claim a refund. Whilst the logos lend authenticity to the email, the salutation does not. Emails from government departments are personalised. Checking the link in the email shows that it does not lead back to the ATO. The link leads back to a site that requires you to supply your credit card details and other personal information. The sites used in these emails have also been known to install malware on the victim’s PC. We will never email you asking for personal or credit card details, and you should never provide this information. The ATO website provides five examples of phishing emails; this particular phishing email is similar to Example 2, with some minor changes. Criminals have been known to re-use phishing emails every 6 months or so, often with minor changes. MailShark has reported this current round to the Australian Taxation Office. If you do receive this email, delete it.